The late Allan J. Riley and his wife, Radwan, have made a multi-million-dollar gift to the University of Notre Dame in support of need- and merit-based scholarships for undergraduate, graduate and professional students. The gift is the largest directed toward financial aid in Notre Dame’s history. The Allan J. and Reda Radwan Riley Scholarships will be awarded to undergraduate, graduate and professional students on the basis of demonstrated financial need or academic merit. The Leo and Edna Riley-Aref and Helena Jabbour Scholarships will be awarded on the basis of need or merit to undergraduate, graduate and professional students who have either lived in one or more of the countries of the Middle East or expressed interest in studying the history, culture, language, literature or politics of the Middle East or individual countries in the region. The initial awards of the two scholarships will be for the 2017-18 academic year. At least 15 percent of the funds drawn annually for the scholarships will be used to assist graduates of schools operated by the Order of the Brothers of the Blessed Virgin Mary of Mount Carmel (often referred to as Carmelite Schools). 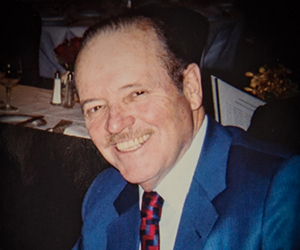 Born in Indianapolis and a 1957 graduate of Notre Dame, Allan Riley was a prominent real estate investor who once owned One Time Square in New York City, as well as other properties in the United States and Great Britain. After graduating, Mr. Riley studied performing arts at Stanford University and served for two years in the U.S. Air Force. In 1964 he moved to New York to join the William A. White Real Estate Company. In the early 1970s, he established his own real estate firm, Allan Riley Realty Inc.
A patron of the arts, Mr. Riley made a gift to Notre Dame in 1982 to renovate a chemistry building on campus, now the Leo and Edna Riley Hall of Art & Design, named in honor of his parents. The Rileys have funded annual student scholarships in the fields of design, art history, studio art and photography, and he served on the advisory council for the University’s Snite Museum of Art. Among his permanent gifts to the museum are a portrait painting by Joshua Reynolds and a landscape painting by Louis Remy Mignot. In 2002, the Rileys funded the purchase of 40 British drawings from the 18th and 19th centuries that remain part of the Snite’s Riley Collection. Mr. Riley served on the Smithsonian American Art Museum Board of Directors, Save the Children Board and the Lincoln Hall Boys Haven Board. Allan and Radwan supported the International Theological Institute (ITI) at Trumau, Austria, and served on its Board of Directors. Mr. Riley’s remains are interred in The Chapel of Trumau, the ITI’s headquarters. A native of Enfeh, Lebanon, Radwan Riley is a graduate of Beirut College for Women, known today as Lebanese American University, where she earned an arts degree. She moved to the United States in 1971 and joined the Permanent Mission of Bahrain to the United Nations, and then joined Save the Children Federation in 1978. Mr. and Mrs. Riley established the Allan and Reda Radwan Riley Foundation, which focuses on educational and charitable giving. Among Radwan’s benefactions is a gift to endow scholarships in the name of her parents, Aref and Helena Jabbour, at the Lebanese American University for students from her district, mainly her hometown. Mrs. Riley serves on the ITI Board of Directors in Vienna, and is a supporter of the ITI. Originally published by Dennis Brown at news.nd.edu on February 05, 2017.